Layer-up in denim all year in our classic stretch vest. The perfect cover-up for fair weather, never too warm or cool. 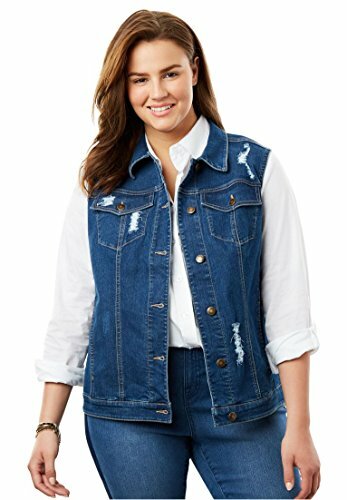 Our plus size jean vest has the best stretch fit you'll ever wear. front and back shaping seams and yokes for a great feminine fit that moves with you 21" keeps you covered to the high hips sleeveless styling with armholes shaped for ease pockets adjustable button-tab bottom band soft washable woven ringspun cotton/polyester/spandex denim or twill imported Women's plus size jean vest in sizes 12W, 14W, 16W, 18W, 20W, 22W, 24W, 26W, 28W, 30W, 32W, 34W, 36W, 38WThe Comfort FactorOur plus size jean jackets and vests have been designed for easy layering and freedom of movement for over 100 years. We go to every length to make our plus size jackets the most comfortable you wear. All the measurements have been determined for your total comfort. Our exclusive stretch denim and twill is the most comfortable in the world.